“We have some genuinely new ideas,” Randall said. “I’ll say from the start that we don’t know if they’re going to turn out to be right, but what’s interesting is that this opens the door to a whole class of ideas that haven’t been tested before, and potentially have a great deal of interesting impacts. Though the black-hole hypothesis adds additional complexity to a number of already-thorny questions about the nature of the universe, Randall believes it will be important to understand if a portion — even a relatively small portion — of dark matter behaves in unexpected ways. Though the exact nature of dark matter remains unknown, physicists have been able to infer its existence based on the gravitational effect it exerts on ordinary matter. Though dark matter is otherwise believed to be non-interacting, two Harvard physics professors have suggested that a hypothetical type of dark matter could form a disk of material that runs through the center of the galaxy. The composite Hubble Space Telescope, Spitzer Space Telescope, and the Chandra X-ray Observatory image of the central region of our Milky Way galaxy above shows the center of the galaxy, located within the bright white region to the right of and just below the middle of the image. Like the downtown of a large city, the center of our galaxy is a crowded, active, and vibrant place. The supermassive black hole — some four million times more massive than the Sun — resides within the bright region in the lower right. The diffuse X-ray light comes from gas heated to millions of degrees by outflows from the supermassive black hole, winds from giant stars, and stellar explosions. 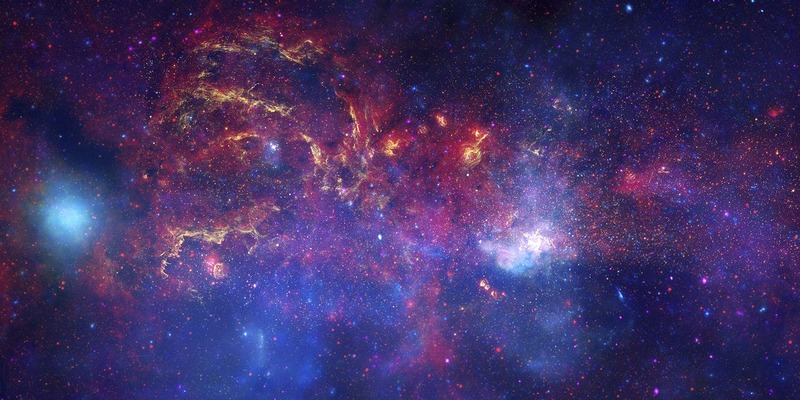 This central region is the most energetic place in our galaxy. If the solar system, as it orbited the center of the galaxy, were to move through that disk, they theorized that the gravitational effects from the dark matter might be enough to dislodge comets and other objects from what’s known as the Oort Cloud and send them hurtling toward Earth. 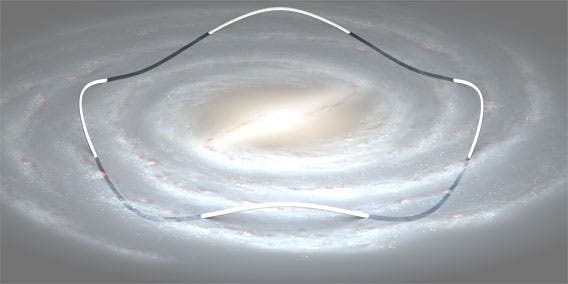 The solar system’s orbit through Milky Way shown below, though exaggerated vertically for clarity, bobs up and down every 64 million years due to the gravity of the galactic disk. The model described by Randall and colleague Matthew Reece suggests that those oscillations occur approximately every 32-35 million years, a figure that is on par with evidence collected from impact craters suggesting that increases in meteor strikes occur over similar periods. Reece’s research centers around connecting theoretical particle physics with new experimental results, building models that attempt to extend the Standard Model of particle physics in ways that address various puzzles arising in quantum field theory and cosmology. Our Sun orbits around the Galactic center, taking approximately 250 million years to make a complete revolution. However, this trajectory is not a perfect circle. The Solar System weaves up and down, crossing the plane of the Milky Way approximately every 32 million years, which coincides with the presumed periodicity of the impact variations. This bobbing motion, which extends about 250 light years above and below the plane, is determined by the concentration of gas and stars in the disk of our Galaxy. This ordinary “baryonic” matter is concentrated within about 1000 light years of the plane. Because the density drops off in the vertical direction, there is a gravitational gradient, or tide, that may perturb the orbits of comets in the Oort cloud, causing some comets to fly into the inner Solar System and periodically raise the chances of collision with Earth. However, the problem with this idea is that the estimated galactic tide is too weak to cause many waves in the Oort cloud. In their study, Randall and Reece focus on this second hypothesis and suggest that the galactic tide could be made stronger with a thin disk of dark matter. Dark disks are a possible outcome of dark matter physics, as the authors and their colleagues recently showed. Here, the researchers consider a specific model, in which our Galaxy hosts a dark disk with a thickness of 30 light years and a surface density of around 1 solar mass per square light year (the surface density of ordinary baryonic matter is roughly 5 times that, but it’s less concentrated near the plane). Although one has to stretch the observational constraints to make room, their thin disk of dark matter is consistent with astronomical data on our Galaxy. Focusing their analysis on large (>20km) craters created in the last 250 million years, Randall and Reece argue that their dark disk scenario can produce the observed pattern in crater frequency with a fair amount of statistical uncertainty. Randall and Reece’s dark disk model is not made of an ordinary type of dark matter. The most likely candidate of dark matter—known as weakly interacting massive particles (WIMPs)—is expected to form a spherical halo around the Milky Way, instead of being concentrated in the disk. This WIMP dark matter scenario has been remarkably successful in explaining the large-scale distribution of matter in the Universe. But there is a long-standing problem on small-scales—the theory generally predicts overly dense cores in the centers of galaxies and clusters of galaxies, and it predicts a larger number of dwarf galaxy satellites around the Milky Way than are observed. While some of these problems could be resolved by better understanding the physics of baryonic matter (as it relates, for example, to star formation and gas dynamics), it remains unclear whether a baryonic solution can work in the smallest mass galaxies (with very little stars and gas) where discrepancies are observed. Alternatively, this small-scale conflict could be evidence of more complex physics in the dark matter sector itself. One solution is to invoke strong electromagnetic-like interactions among dark matter particles, which could lead to the emission of “dark photons”. These self-interactions can redistribute momentum through elastic scattering, thereby altering the predicted distribution of dark matter in the innermost regions of galaxies and clusters of galaxies as well as the number of dwarf galaxies in the Milky Way. Although self-interacting dark matter could resolve the tension between theory and observations at small-scales, large-scale measurements of galaxies and clusters of galaxies only allow a small fraction (less than 5%) of the dark matter to be self-interacting. 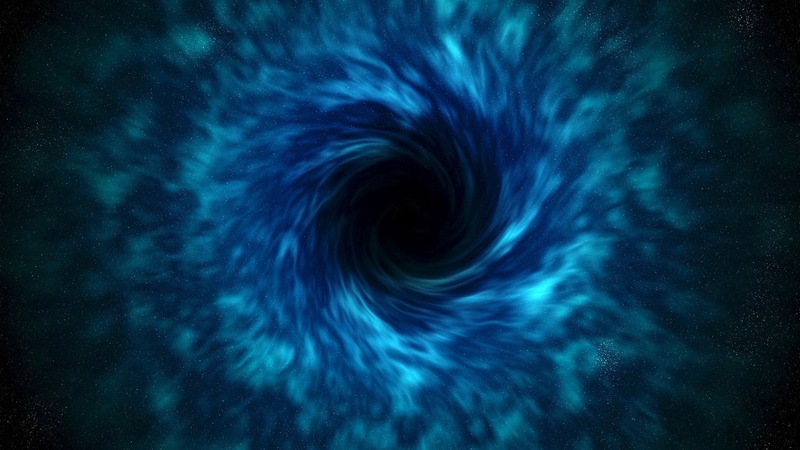 Recently, Randall, Reece, and their collaborators showed that if a portion of the dark matter is self-interacting, then these particles will collapse into a dark galactic disk that overlaps with the ordinary baryonic disk . So, did a thin disk of dark matter trigger extinction events like the one that snuffed out the dinosaurs? The evidence is still far from compelling. First, the periodicity in Earth’s cratering rate is not clearly established, because a patchy crater record makes it difficult to see a firm pattern. It is also unclear what role comets may have played in the mass extinctions. The prevailing view is that the Chicxulub crater, which has been linked to the dinosaur extinction 66 million years ago, was created by a giant asteroid, instead of a comet. Randall and Reece were careful in acknowledging at the outset that “statistical evidence is not overwhelming” and listing various limitations for using a patchy crater record. But the geological data is unlikely to improve in the near future, unfortunately. On the other hand, advances in astronomical data are expected with the European Space Agency’s Gaia space mission, which was launched last year and is currently studying the Milky Way in unprecedented detail. Gaia will observe millions of stars and measure their precise distances and velocities. These measurements should enable astronomers to map out the surface-density of the dense galactic disk as a function of height. Close to the plane, astronomers could then directly see whether there is a “disk within the disk” that has much more mass than we could account for with the ordinary baryonic matter. Evidence of such a dark disk would allow better predictive modeling of the effects on comets and on the life of our planet. Over the next several years, Randall said, the Gaia satellite will perform a precise survey of the position and velocity of as many as a billion stars, giving scientists far greater insights into the shape of the galaxy and into the potential presence of a disk of dark matter.